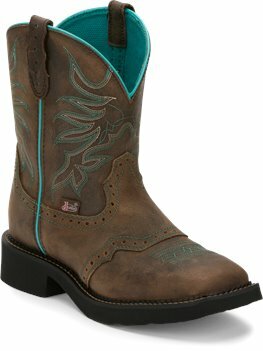 Be bold in the Mandra Chocolate 8-inch tall Justin Gypsy™ Women's cowboy boot. The chocolate brown leather exterior is tastefully accented by a vivid turquoise delicate stitch pattern, outer seam, and interior. 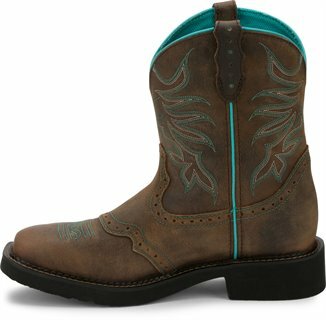 This cowgirl boot is made for comfort as much as it's made for style with a wide square toe, rubber outsole, and J-Flex Comfort System® insoles with a removable orthotic inserts for an easy fit and lasting support.